Live TV on your PC, in a window or full screen! How do we make the world’s best and most reliable TV tuner hardware for PC’s even better for our customers? By giving it brilliant new software. As we move from the age of analogue to digital and now high definition TV broadcasts, it leaves us all having to upgrade our TV set’s and set top boxes in order to keep up to date. Well here at Hauppauge we have had to do the same, while all our digital hardware has been able to receive HD broadcasts for some time, our software unfortunately hasn’t. So we took the opportunity to not only add HD capability, but completely redesign our software from scratch. WinTV Extend is a built-in Internet video server for the WinTV v7.2 application. 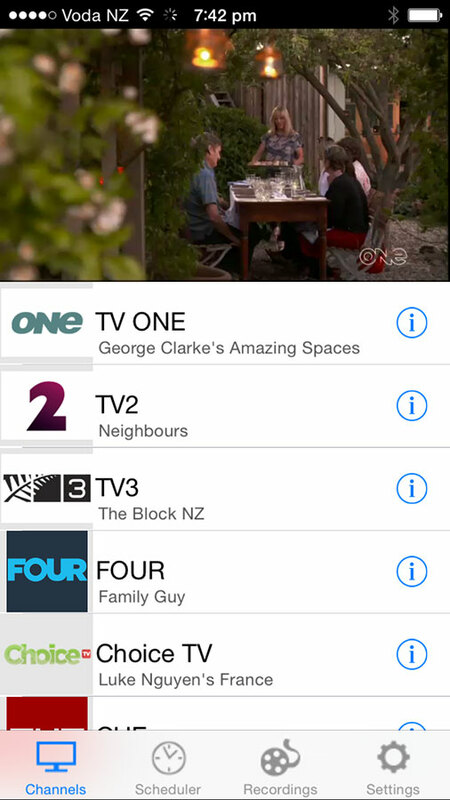 WinTV Extend will take your live TV signal and send it to your iPhone, iPad, iPod touch, Mac or PC computer over either a home WiFi connection or over the Internet*. 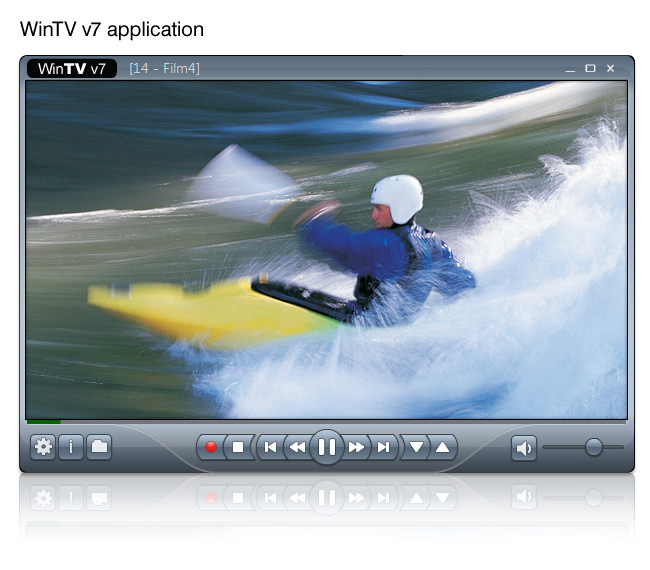 WinTV v7.2 is available from the Hauppauge webstore as part of the WinTV HD CD. You can order it from our webstore. All you need on your iPhone/iPad/iPod touch is a Safari browser pointed to your PC at home**. If you are using a Mac or a PC, all you need is a browser (Safari recommended on the Mac) and a Flash video player. Here are some screen shots of an iPhone receiving video from WinTV Extend. 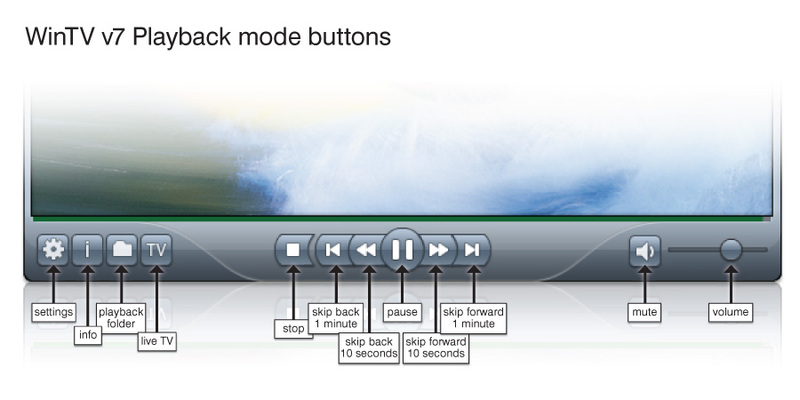 The iPhone pictures show the TV control overlay with Pause and 30 second replay. * WinTV Extend will attempt to scale the video stream depending on bandwidth available, streaming via mobile internet is subject to phone reception and may incur high usage on your phones data tariff, please check with your mobile provider about cost and availability of this service. ** You will need to know the IP address of your computer and your home router/firewall will need to be configured to allow a direct connection. To remove the TV tools (called "No Title mode"), double click your LEFT mouse button in the live TV. Window,to Watch TV full screen double click again, to exit full screen hit the ESC key. 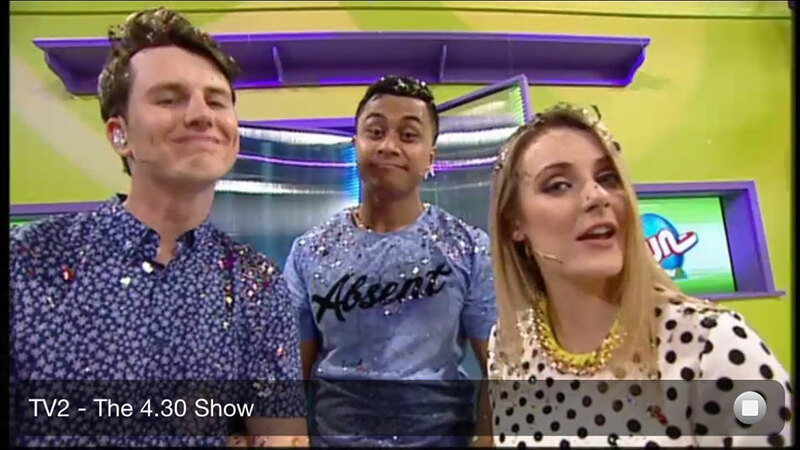 You can also change the viewing modes from a drop down menu by a right click in the live TV window. Changing TV channels: Click Channel Up or Channel down. Or RIGHT click in the live TV window to the drop down menu and go to channels which will display the current TV channel list for fast channel changing. You can also change channels by using the numbers on the keyboard or by pressing the letter on the keyboard for the channel name that you want to view. Record TV: click the red Record button to start recording.. When you are finished recording, click the stop button then click the TV button to return to live TV. You can automatically schedule a recording by using the Hauppauge WinTV Scheduler and Guide. Playback: Click the folder button to open your video folder to select the file for playback. Audio setting: RIGHT click the mouse button on the "audio stream" you can change the available audio language settings of the current TV program that you are watching. 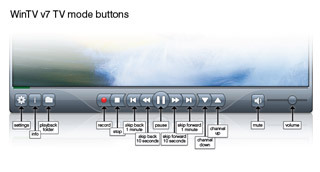 Control menu: RIGHT click the mouse button in the TV window, the control options are displayed. In order to re-size the window, move the mouse pointer to the edge of the TV window. This changes the mouse pointer into a double arrow. Press and hold the left hand mouse button and drag the window into the desired size, releasing the left mouse button when finished. Where can I find the manual for WinTV 7? 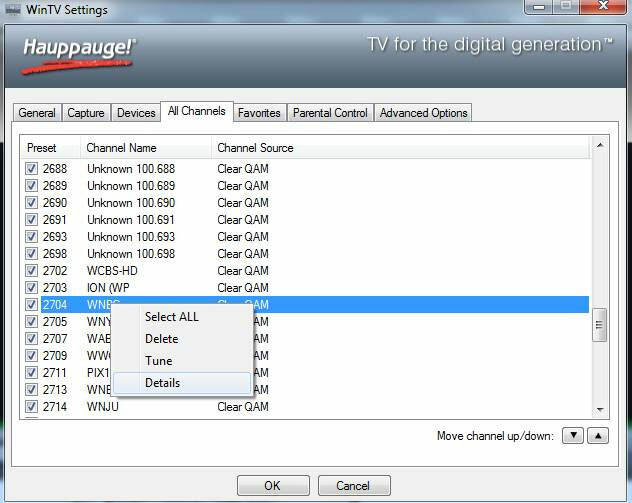 How do I install the WinTV 7 upgrade from the Hauppauge website? In order to upgrade your present version of WinTV you need to have a Wintv 6 or Wintv 7 installation CD to validate the upgrade. After you download the update insert the WinTV CD in the CD Rom drive (if the CD autoruns and opens cancel the install.) then click on the WinTV 7 download to install. Open WinTV 7 and click on the setting button (Gear) in the lower left of the application then click on the devices tab and highlight your Wintv device and click Tuner setup. Here you can choose from analog digital or external inputs, or all three. How can I save my TV Channels database? Copy the hcwChanDB_5 files to a place for safe keeping. To replace saved channels, just copy the HcwChanDB_5 files back into the Channel Database folder. How can I reorder or change the channel numbers in WinTV v7? Open the Settings menu in WinTV v7 by clicking on the “gear” button in the lower left hand corner of the WinTV v7 application. 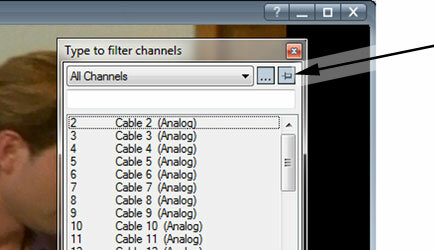 Then click on the “All Channels" tab and right click on the channel you wish to edit. Click Details. Change the Preset number to the number you want. You can also change the channel Name. You can change the default directory by clicking on the Settings icon in WinTV 7 (the 'gear' icon on the lower left hand corner of the WinTV v7 app window), then the Capture tab. Here you will see the recording directory. You can click on Browse and pick a new directory. I am getting a black screen in WinTV v7, or I'm seeing choppy video images. What can cause this? Signal strength. If the TV signal strength is on the edge of being too low, you might see either a black screen where the live TV picture should be, or your live TV picture might be choppy. Also, be sure that the incoming signal from your video source is working properly. Graphic display adapter related. 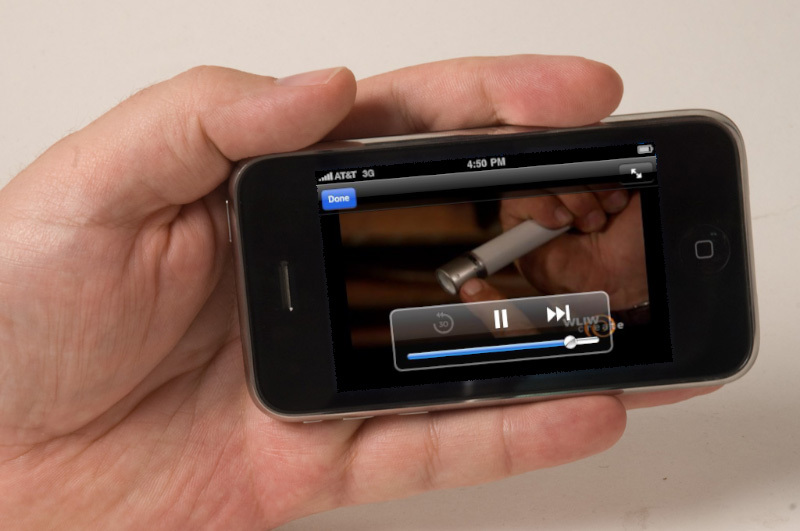 The video graphics accelartion mode can cause choppy live video or possibly cause a black screen where the live TV picture should be. To optimize the video graphics mode, in the WinTV v7 application go to Settings and look under Video Renderer. EVR is the default setting. Try VMR 7, VMR 9, or overlay for better results. You may also try placing a check mark in “Use hardware acceleration when possible”. 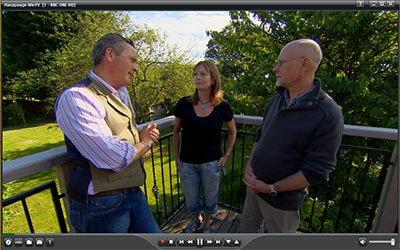 What video format will WinTV v7 record in? WinTV 7 will save the recordings in a transport stream format (.TS extension). These files may be converted to MPEG2 using options in the WinTV v7 Configuration menu. What software can I use to edit & burn the recorded files from WinTV v7? You can use any software editor that can work with .TS files or MPEG-2 files. Here are a few examples. On those WinTV products with FM radio, you can scan for FM radio channels by clicking the Setup button (gear button) and then clicking on the Device tab. Choose your WinTV product, and then click Tuner setup. 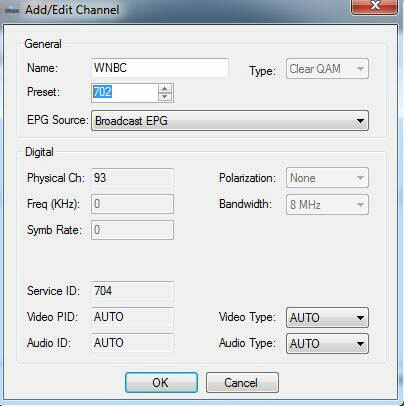 If your WinTV TV tuner supports FM radio reception, you should see 'FM radio' listed under the types of TV formats. Then click Analog FM radio and then Scan. How can I see the WinTV v7 channel list all the time? You can display the TV and FM radio channel list all the time by Right Clicking on the live WinTV v7 window to bring up the Options menu, and then clicking Find channel. You will see the Channel list (see picture below). 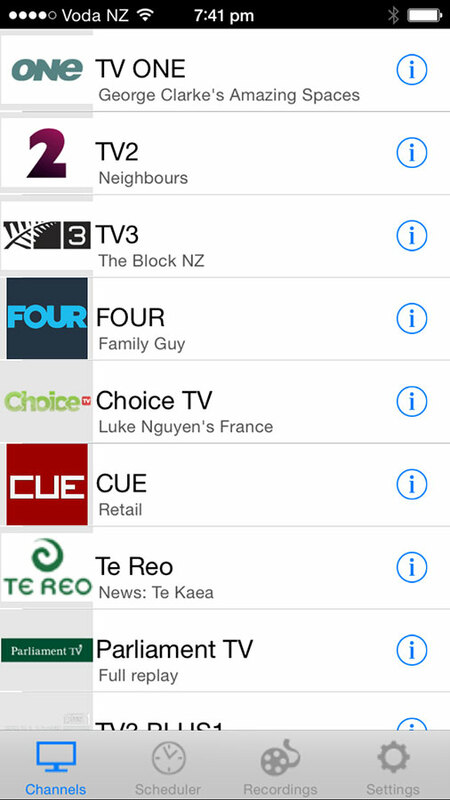 In the upper right hand corner of the Channel list is a small "pin" icon. Click this icon to "pin" your channel list to the WinTV v7 window. WinTV v7 lets you control more than one WinTV device in your system. WinTV v7 has an integrated Guide and scheduler to make your programming quick and easy! Just right click in the TV window for a drop down menu. Monitor the signal you are receiving to allow you to improve aerial placement or correct signal problems on the fly! WinTV v7 Monitor the signal you are receiving to allow you to improve aerial placement or correct signal problems on the fly! Teletext on supported digital satellite channels can now be viewed within the WinTV v7 application overlaying the TV screen. Play back different types of files through our WinTV v7 application, now not only can you play back the files you have recorded but you can open and watch other video files on your system making WinTV v7 a multi purpose application!